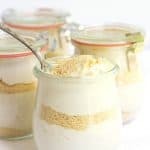 These no bake cappuccino trifles are for coffee lovers! They have buttery shortbread and french vanilla cappuccino mousse layers in them that are packing some flavor! Did I mention that they're incredibly easy to make? Add the shortbread cookies into a storage bag and crush with a rolling pin. You can use a food processor as well. In a small bowl, stir together hot water and french vanilla cappuccino mix until smooth. Set aside. In a large bowl, cream together cream cheese and sugar with a hand mixer until smooth. Add the cappuccino mixture into the cream cheese and beat until incorporated. Using a spatula and scrape down the sides and bottom of the bowl. In a separate bowl, beat the heavy cream until stiff peaks form. Fold the whipped cream into the cream cheese mixture until incorporated. Add the cappuccino mousse into a large storage bag or disposable piping bag. Cut the corner out of the bag. In four 1 cup jars, add in 2 tablespoons of shortbread crumbs. With some heavy pressure, pipe the mousse on top of the shortbread. Give the jar a few taps to even out the mousse. Repeat the layers of shortbread crumbs and mousse. Finish with another layer of shortbread crumbs.